Hoist the black flag and set sail on deadly seas! The scallywags, buccaneers, and beasts of the Pathfinder Adventure Path: Skull & Shackles campaign burst onto your game table in a blast of cannon fire and brimstone! This brand new set of Pathfinder Battles prepainted plastic figures features 55 all-new sculpts drawn from the gorgeous art in Paizo’s Skull & Shackles Adventure Path. Tessa has a nice pose. The details and paint job are good. She's probably the best female pirate from the set. I bought two and both have the head glued on in a wiered way. A nice rendition of Tessa Fairwind in plastic, although with some flaws. The pose seems kind of stiff, the paintjob has got some noticeable areas where the paint has went out of bounds. The face is decent but it leave the figure with an concerned expression. Perhaps not that fitting to the model. All and all a good figure, with some drawbacks. 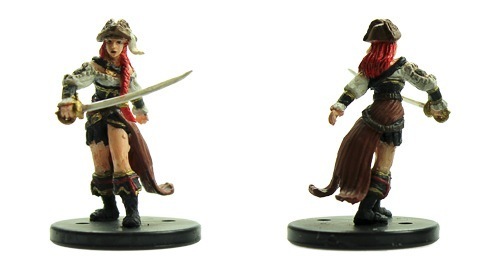 Sign in to start a discussion about Pathfinder Battles—Skull & Shackles: Tessa Fairwind!